Lemon rice is one of those rare dishes that revels in its tanginess. 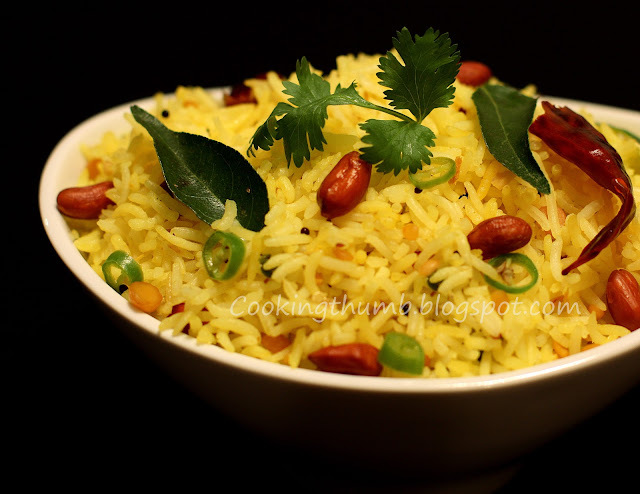 It is one of the popular rice dishes originating from South India, along with other tasty rice dishes like Curd Rice, Tomato Rice, Tamarind Rice. You will be amazed at the transformation that some lemon juice, chillies, mustard seeds, and lentils will bring about to bland rice, turning it into a full-blown delicious meal. The coolness of Mint-Cucumber Raita (Cucumbers in mint-flavored yogurt) and crunchy poppadums serve as perfect complements to the zesty Lemon rice. I usually serve it on days that I need to rustle up something delicious and filling at a short notice, or on hot summer days when I am feeling too lazy to spend too much time in the kitchen. It is also a great lunchbox food for kids. Enjoy! Make sure your cooked rice is not mushy and the grains are separate. Add mustard seeds. When the mustard seeds start to splutter, add Bengal gram and skinned split black gram. Saute till the lentils turn light brown in color. Add peanuts, minced ginger, curry leaves and red chillies. Saute for 30 secs. Add asafoetida and turmeric powder. Saute for 10 seconds. Add cooked rice, salt, lemon juice & green chillies. Mix well very gently such that the rice grains do not break. Adjust salt & lemon juice to your taste. Once the entire rice is hot enough. Turn off the heat. Transfer it to a bowl. Garnish with cilantro leaves. Serve with Mint-Cucumber Raita and pickle. Lemon rice looks yum!!! They are the quickest comfort food I rely on when I am lazy. Nice snap too!! Thanks for stopping by, Modular Kitchen!